Focus on feelings – When you write about your daily life events make sure you write about how you feel too. These don’t have to be long accounts of your day, just simple entries that allow you to express how you feel about the day’s events. By noting down our feelings about our experiences we often challenge our beliefs about ourselves and in time this leads to further self growth. Past memories – When you have a day you don’t feel is worth writing about, think back and write about a childhood memory or any event in your past that you do feel strongly about. This is especially useful when you don’t have a good day. Going back to a happy time and writing about it, recalling how you felt then can help to change your focus and improve your current mood. Dreams – You might have to keep your journal close to your bedside so you can get these down while you remember the details. 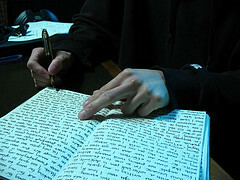 Writing down dreams has been useful to people who experience recurring dreams that bother them. Gratitude – Make a list of everything you are thankful for. This can be from the toaster in your kitchen to your talents. It’s a very useful activity to help you focus on everything that is “right” in your life and will help you develop an awareness of how blessed you are. Acknowledgments – At the end of the day write down three to five things you have achieved for which you want to acknowledge yourself for. An example might be; ‘I acknowledge myself for tidying my bedroom cupboards today.’ It may seem insignificant, but recognizing our achievements no matter how small helps us to validate our personal contribution to life. Abundance – Attracting more abundance into your life starts with noticing how abundant you already are. Keep a log of abundance you experience on a daily basis. For instance someone may buy you coffee or lunch, give you a lift or you may find 20c lying on the ground. Write down all the evidence of abundance you attract in to your life and soon you will realize that you already are abundant. Goals – Goals are statements about what you want but don’t yet have in your life. Your journal is a good place to write these down and reflect on your plans to see if your life is going in the direction you want it to. A good way to start is to write a detailed description or sketch what your ideal life would be like if you could have anything you wanted. It is said if your mind can see something then it can be achieved.Â Once you have the bigger picture in place, you can choose parts to work on as goals. Marcus Baker was hopeless at network marketing for many years. He never gave up. Eventually he realized what he was missing. Now he is committed to sharing what he has learned with wannabee online marketing entrepreneurs, helping them find their power and become more successful than they ever imagined they could be.